Overlooked Elvis Presley Stamps - Misc. Four new Elvis stamp sheets have been released recently from Tanzania, Gambia, St. Vincent - Bequia and Antigua & Barbuda. This one pictured here, is from Tanzania. This Official Government Issue postage stamp sheet honors "Elvis in the Movies." 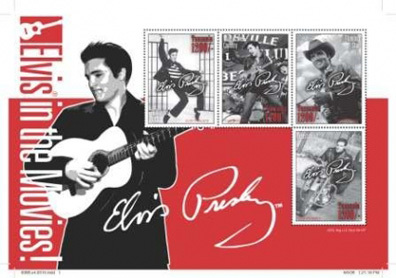 Each of the 4 stamps on the sheet feature an image of Elvis staring in either "Jailhouse Rock," "Wild in the Country," "Flaming Star," and "Roustabout" overlaid with a copy of Elvis's distinct signature. The Stamps are framed with an attractive artist's rendition of Elvis on the guitar also overlaid with Elvis autograph. These stamps were released by Tanzania Post on September 8, 2008 but it took until now to find out about it. "Wild In The Country" & Flaming Star" became "Loving You" & Stay Away Joe" ? Money grubbers. Making a buck off The King. Those stamps are not made in the afore mentioned countries. do they also have them of The Stamp Quartet in Transylvania?..